There are many things I love about a chicken. Of their many great creature features it can be difficult to choose a favorite. Is it those beady, bright eyes staring back at you with a slightly cocked head? Or is it the brilliantly-plumed, graceful neck and head that stays neatly tucked beneath a wing each night? Perhaps it is those scaly, scratching, furiously fast feet that never cease to run without obvious purpose? It is hard to say yet…. while I love all these things about a chicken my favorite feature has got to be those fluffy bottoms! Not many of God’s creations (human or animal) can boast about their adorable, fluffy booty. These gal’s can! 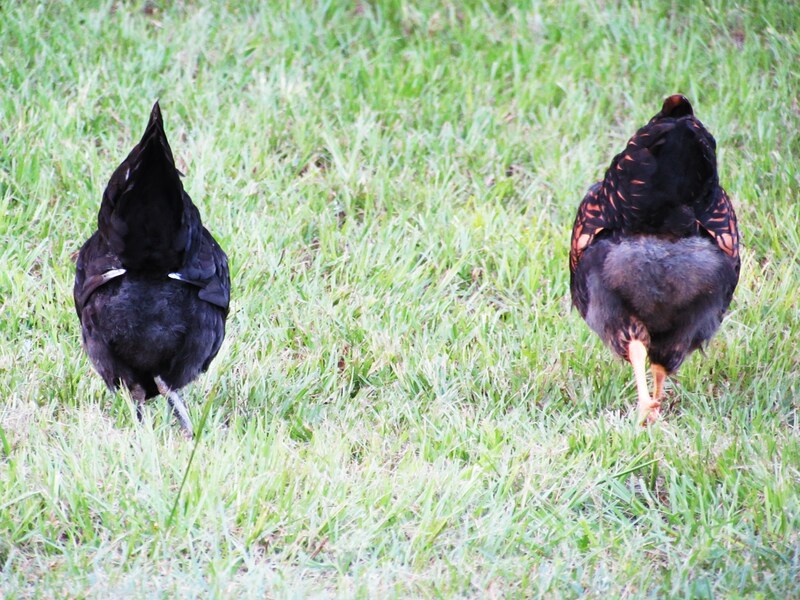 Peck on ladies, keep rocking that fluffy bottom look. Queen would be proud. Scratch on ladies and work that fluff! Jaime was wondering the same this morning as to why she loves her chickens. I think each one has its own unique character which makes them so special. Alas, fluffy bottoms are only appreciated on our feathered friends!